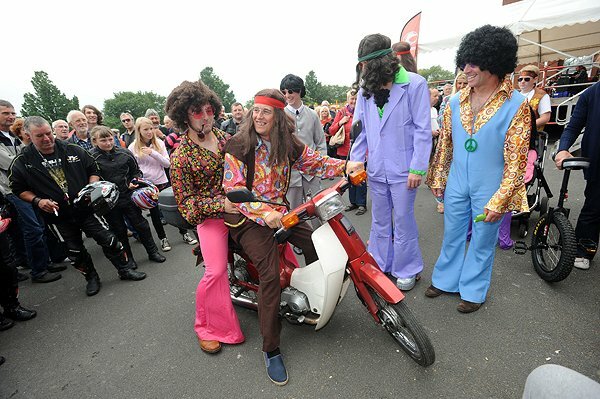 The Classic TT paddock will be turning back the clock this Friday 22nd August to celebrate Joey's decade of dominance and inviting everyone to dig out their stretch jeans, Kicker boots or New Romantic regalia and join in with the leading TT riders in the fancy dress extravaganza. You can expect an 80's flashback when you arrive at Glencrutchery road with chatshows and live music from 10am as the Nigel Williams band plays all those foot stomping memorable tunes from that decade of colour, deely boppers, flashing shoes and glitter. RJ Woolsey will also be bringing his own interpretation of those memorable songs. Manx Radio Classic TT will be digging deep into its archive with a non-stop playlist of Queen, Dire Straits, Michael Jackson and Phil Collins as well as some long forgotten tracks that will instantly transport you back to that heady decade. However, its not only music that came out of the decade. The leading TT racers will be putting aside their bikes for a head to head of a different kind as they look to take the honours in the inaugural space hopper race in pit lane. Early pre-race favourites include John McGuinness, Philip McCallen and Ian Lougher, who will be looking to use their experience from the 80's but there are likely to be a number of young challengers including Michael Dunlop, Lee Johnson and Jamie Hamilton. The purple helmets will also be bringing their disorganised mayhem to pit lane in a display of all things anarchic and chaotic before the paddock returns to the final Classic TT qualifying session.